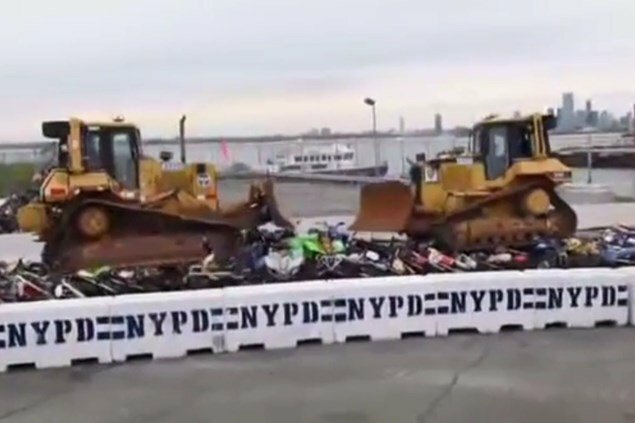 A MONTH ago we told you of plans in New York to broadcast live footage of confiscated motorcycles being crushed. It sounded like bluff and bluster, but they’ve gone ahead and done it. Admittedly, it wasn’t ‘live on TV’ as mayor Bill de Blasio originally said, but it was live on Facebook. The cruel punishment came to bikes that were confiscated for not being road legal. There’s been a trend for ‘gangs’ of riders using motocrossers and non-road-legal quad bikes on the streets of New York. Funnily enough, the comments on the Facebook stream haven’t been unanimous in their glowing praise for the scheme. A large proportion have noted that the confiscated bikes could have been donated to charity or auctioned to raise money for the city. The footage of the crushing can be seen here. The vast majority of the 33 minutes of footage is simply time-wasting panning over the unfortunate victims – skip to 30 minute mark to see the bulldozers spring into action. The first 3D printed electric motorcycle?